After reading so many blog posts about making homemade play dough, I finally decided to give it a try. You'd think after six years of parenting I might have tried making a batch before this! I glanced at various recipes, including ones posted on Almost Homeschoolers and Little Page Turners, and decided to make a small test batch using the following recipe from our local family resource center. This recipe is amazingly simple to make. The kids really liked kneeding the warm dough and squishing it with their fingers. The dough has a nice, soft, silky texture and is easily moldable. Combine all ingredients in saucepan. Cook over medium heat, stirring constantly until it forms a ball. Remove from pan, cool slightly and kneed till smooth. Store in an airtight container in the refrigerator. Since St. Patrick's Day is only a couple days away, we decided to color our playdough green. I experimented by substituting strained peppermint tea water for the water in the recipe. Unfortunately, after cooking, the peppermint tea smell wasn't very detectable. I was also hoping that the tea would make a nice mossy green color, but it "looked yucky" according to my kids so I ended up adding green food color. Further experimenting, we added the dried tea leaves directly to the play dough, and pretended that we were adding ground up shamrocks! 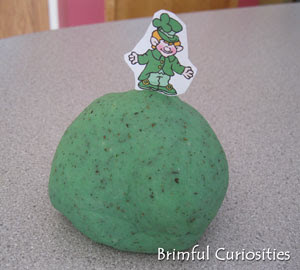 This "shamrock" playdough has an interesting grainy texture and looks mossy. It also has a more pronounced peppermint tea smell (be careful experimenting with teas and/or essential oils if someone in your family is sensitive to fragrances or has sensitive skin). I think next time we'll try adding mint extract and maybe add some gold glitter to the dough. I'm sure the area leprechauns will come our way shortly to sneak a peek. Perhaps we'll finally capture one of those tricky little fellows this year! Have you tried making your own play dough? Did you have success adding scents to the dough? We make our own play dough all the time. I have added vanilla, almond, coconut, and peppermint extract at different times (not all together, of course!). We have also added cocoa powder, spices, glitter and food coloring. I find the best way to add all of these things is to add them before you cook the dough and mix it really well. I love the idea of shamrock play dough. I've never tried making my own, but this is fun to see what worked and didn't. I think it's pretty cool looking though. This looks like a fun batch of play dough. We make it pretty regularly and try different things. Some work and well, some don't. This is fun. I used to make this stuff when I was a kid. I have yet to make it for my own kids. I'll be following your recipe soon. Thanks for posting! That's my mom's recipe... it's the best! I love that you added glitter. I'll have to try that sometime.